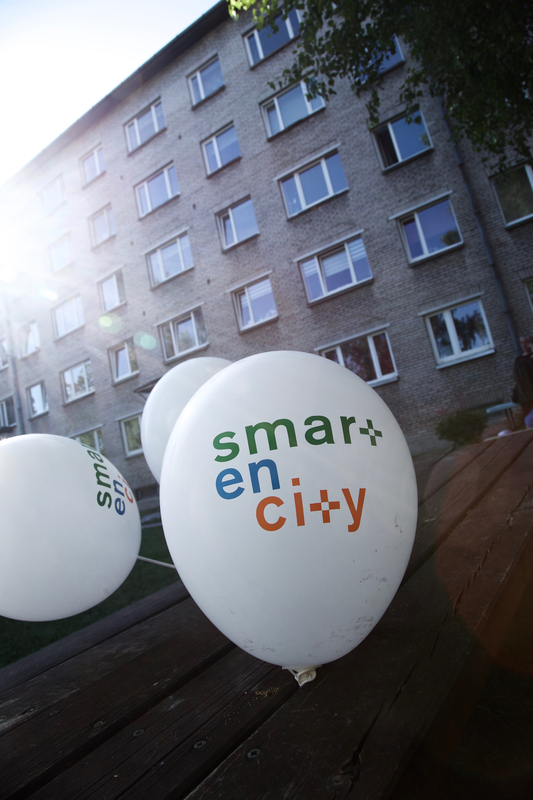 8 June / Yet another information evening took place on May 21, 2018 for residents of the housing associations participating in the SmartEnCity project. All those interested were invited to the cosy and calm backyard of the Tiigi 8 building, which is located in the pilot area and is a member of the SmartEnCity project. Nearly one hundred people participated in the event. The main presenter of the evening was well-known radio personality and history professor David Vseviov, who gave an interesting presentation on the history and current state of soviet era Khrushchyovka apartment buildings. SmartEnCity project manager Raimond Tamm spoke about the course of the project and the practical issues associated with the renovation works, while art curator Kadri Uus spoke about the artworks planned for the facades of the apartment buildings. Participants were also able to view an exhibition of the planned artworks. The presenters were peppered with questions. Since the event was intended for families, children were also brought along, with entertainment being offered in the form of games and competitions. Children were also able to offer their own ideas for the artistic solutions for the buildings in the form of a drawing competition. Pancakes were made on the spot and warm drinks were served. This was the fifth in the series of pilot area resident information days.